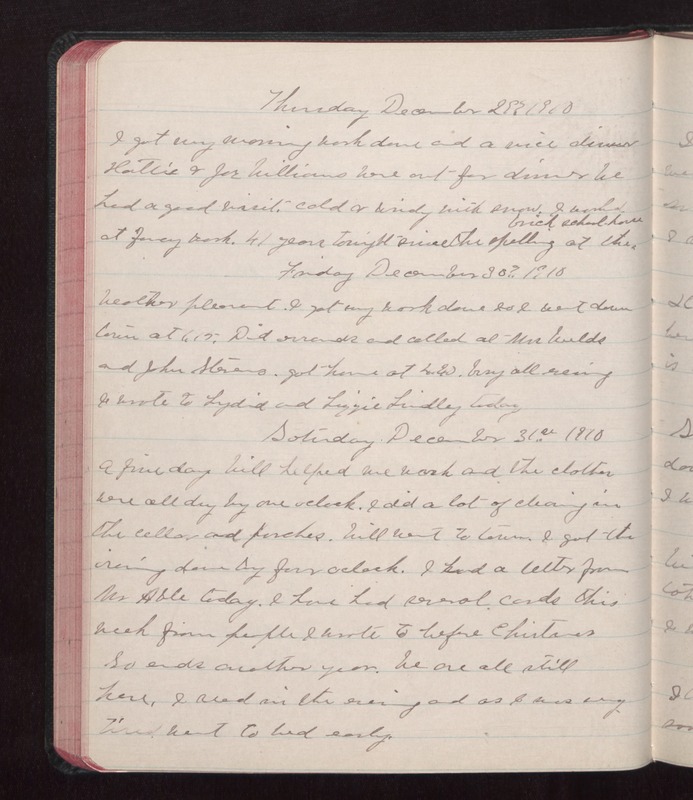 Thursday December 29 1910 I got my morning work done and a nice dinner Hattie & Joe Williams were out for dinner We had a good visit. Cold & windy with snow. I worked at fancy work. 41 years tonight since the spelling at the brick school house. Friday December 30 1910 Weather pleasant. I got my work done so I went down town at 1.15. Did errands and called at Mrs. [Wilds?] and John Stevens. got home at 4.30. Busy all evening I wrote to Lydia and Lizzie Lindley today Saturday December 31 1910 A fine day Will helped me work and the clothes were all dry by one oclock. I did a lot of cleaning in the cellar and porches. Will went to town. I got the ironing done by four oclock. I had a letter from Mr Able today. I have had several cards this week from people I wrote to before Christmas So ends another year. We are all still here. I read in the evening and as I was very tired went to bed early.